Windsor Park is a rather large planned community just a few miles north and east of downtown and UT and is in the 78723 zip code. Located between Highway 290 to the north, East 51st Street to the south, Northeast Drive to the east, and Interstate 35 to the west, it is conveniently located in the central east part of the city. Adjacent to the University Hills subdivision, the two areas share many similarities such as winding, tree shaded streets, ranch style homes and a popularity with first time buyers who are attracted to the spacious yards and proximity to inner city living. Developed from 1954 to 1968, Windsor Park is one of Austin’s earlier planned communities. The streets wind irregularly through the sloping hills and have a decidedly English flavor to their names: Ravensdale, Westminster, Dorchester, Brunswick, Wellington, Darlington, Trafalgar and Suffolk to name a few. The area encompasses over 2.5 square miles and the median age of the population is around 30 years old for both men and women. If vintage ranch living is your cup of tea, then you have found the right fit for your life style! While many homes in University Hills have been updated for modern tastes, many are still waiting for you to bring your own personal tastes to the table and have fun with retro design. Whatever your preferences, there is usually something that will get your creative juices flowing and all for an affordable price. The average home in the area is around 1,300 square feet with 3 bedroom and 2 baths. Priced at around $150,000, and $125 per sq. ft., you may pay more depending on the remodel factor. Find one that is waiting for your own touches and have fun putting the 60s back in your life! Only a short drive to shopping at the new Mueller development, Capitol Plaza, or Highland Mall, the area offers plenty of neighborhood shops and dining establishments. Dottie Jordan Park is in nearby University Hills and the hiking and biking trails of Mueller are available to everyone in these surrounding communities. Bartholomew Park has sports courts, baseball fields, basketball courts, picnic tables and a public swimming pool. And the walking trails link to neighboring Patterson Park and its Parr Tennis Center are just a short distance away. 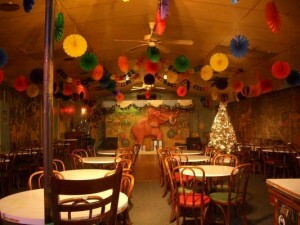 Finally, don’t forget the iconic Carousel Lounge with its giant elephant and quirky circus theme; it’s a favorite watering hole for Austinites!